Chantilly is a small town located 40km north of Paris.For over four centuries Chantilly has been living to the rhythm of its Chateau. Since Anne de Montmorency in the XVIth century, the Chantilly grounds have seen many nobilities through time; kings, princes, dukes, duchesses, poets. the lace manufacture was establishedin the seventeenth century by the Duchesse de Longueville; the name of a lace-maker, Charlotte Martin, is mentioned in 1700, and about 1750 there were three houses of lace-dealers, Moreau, Le Tellier, and Lionnet . What kind of lace was then made is doubtful, but it is most likely that it was something in the way of Gueuse or point de Paris; at any rate it is certain that the manufacture of silk bobbin-lace was a later introduction. Like other French fabrics, Chantilly suffered in the Revolution, and had a short period of comparative prosperity under the Empire. In 1805, the Chantilly lace was then in fashion in Paris. Llarge patterned blondes were also made for exportation to Spain and her American colonies. The lace industry has been driven away from Chantilly by the increase in the price of labour consequent on its vicinity to the capital, and by the competition of Calvados. The grounds used in Chantilly were the Alencon ground, and the fond chant (an abbreviation of Chantilly), or six-pointed star reseau. Chantilly, in the early nineteenth century, was exported to Holland, Russia, Germany, Portugal, and England. After 1827, the trade considerably declined, and its decadence was further accentuated from 1830-40. Until 1840 Chantilly was made in bands from 10 to 12 centimetres wide, which were afterwards invisibly joined. After 1840, in the reign of Louis Philippe, Chantilly came into favour, and large pieces were designed, often made in one piece, fichus, shawls, and later "barbes." In the reign of Napoleon III. very ambitious and remarkable specimens of Chantilly were produced, the ornament delicately " shaded." In 1870, the lace houses became bankrupt somewhat suddenly, many parchments and unfinished pieces of lace were left in the hands of the workers and never claimed, and a great deal of Chantilly was sold at a loss to the Prussians during the siege of Paris. Chantilly lace has the six-pointed star ground, the fond chant as it came to be called, of the old point de Paris, but often combined with it is the fond simple or fond clair of Lille. 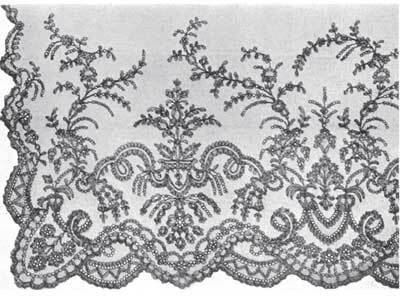 This latter reseau is, as a rule, worked into the spaces of the pattern along the edge of the lace. There is a cordonnet made of a thick, untwisted very shiny silk thread. Chantilly was greatly esteemed by French ladies of rank and fashion and is mentioned over and over again in Royal accounts and inventories. Naturally it fell with its patrons, but its manufacture was revived under the First Empire ; it again became the mode and remained in favour for many years. Made of black silk it was particularly popular between 1830 and 1840, but by that time the great proportion of lace made in the Chantilly style came from Caen, Bayeux and Le Puy. Chantilly black lace has always been made of silk, but from its being a grenadine, not a shining silk, a common error prevails that it is thread, whereas black thread lace has never been made either at Chantilly or Bayeux. 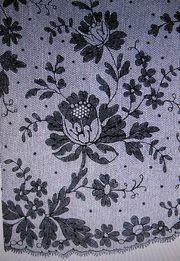 In the inventories of the eighteenth century black lace and black silk lace appears fairly frequently.